Every day the United States government collects data and nobody likes personal information collected, but there is other information collected that we need which is very helpful, such as data used in determining the health of the economy. 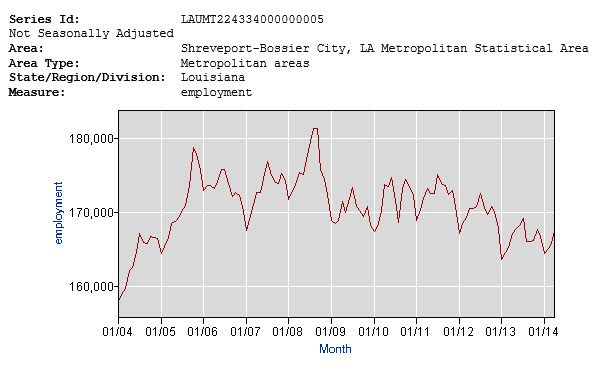 One of the most important numbers collected by the Department of Labor is how many people are out of work broken down by major city, and the latest data are in. April’s preliminary national unemployment rate in April was 5.9 percent, not seasonally adjusted, down from 7.1 percent a year earlier, and down from March’s unemployment rate of 6.3 percent. 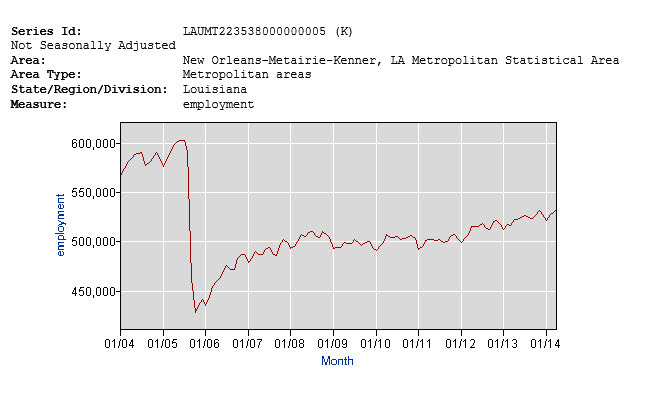 For seasonally adjusted numbers, the unemployment rate fell from 6.7 percent to 6.3 percent, and the number of unemployed persons, at 9.8 million, decreased by 733,000. Unemployment rates were lower in April than a year earlier in 95 percent, or 357 of the 372 metropolitan areas, higher in 12 areas, and unchanged in 3 areas, according to the U.S. Bureau of Labor Statistics. Not all areas enjoyed a reduction in the number of people out of work since 14 areas had jobless rates of at least 10.0 percent while 118 areas, or 31 percent, had rates of less than 5.0 percent. The unemployment rate is based on the number of unemployed divided by the number in the workforce, so if the number unemployed declines but the number in the workforce declines by a greater percent, then the ratio, or unemployment rate, can actually decline even though there are more people unemployed. 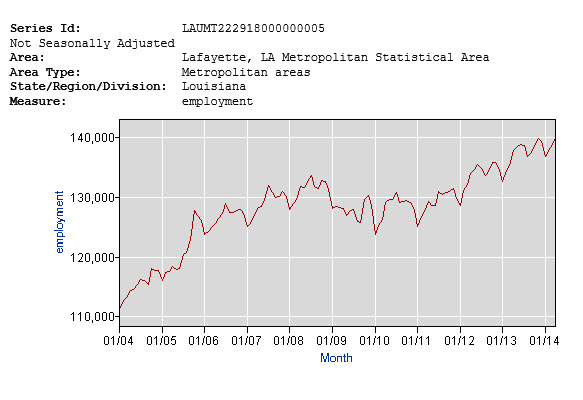 One way to derive a realistic conclusion is to examine the actual number employed, and nonfarm payroll employment increased over the year in 302 metropolitan areas, decreased in 17 percent or 63 areas, and was unchanged in 7 areas. 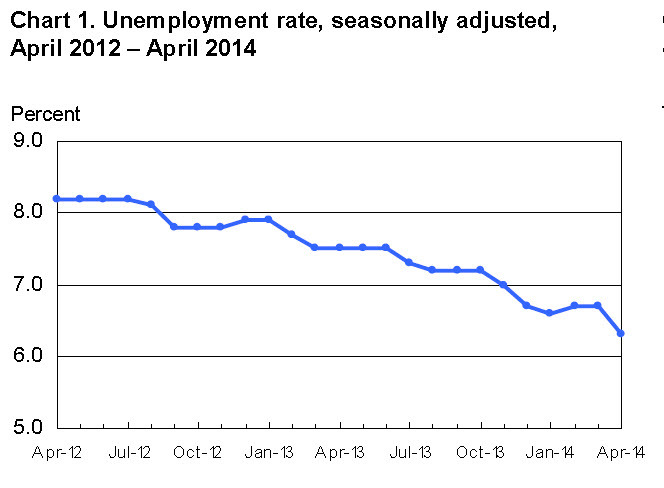 Highest unemployment rate: Yuma, Arizona at 23.8 percent. 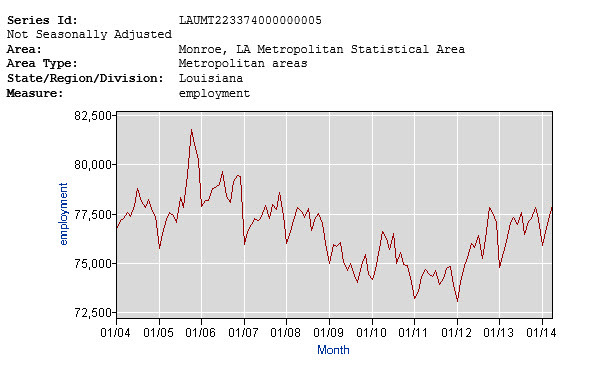 Lowest unemployment rate: Midland, Texas at 2.8 percent. 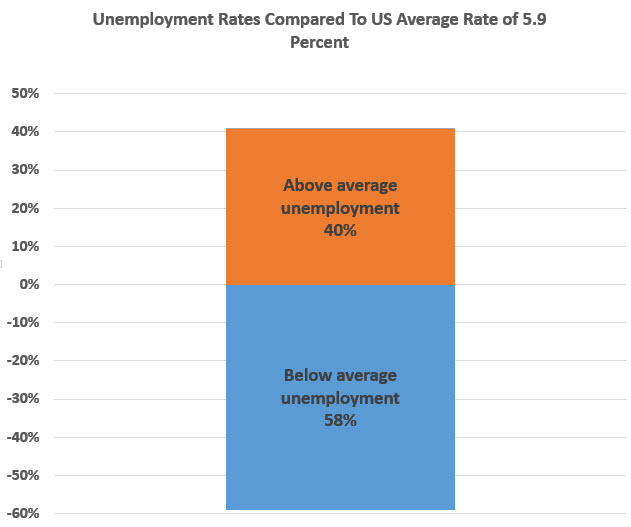 About 58 percent of the 372 metropolitan areas had unemployment rates better than the US average, and 40 percent had rates worse than average, as shown in the chart below. 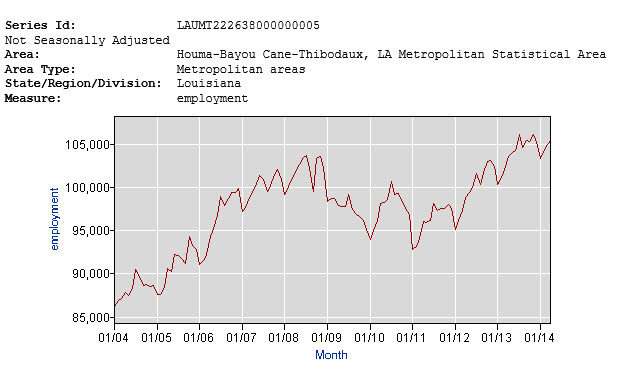 Looking closer to home, the major cities in Louisiana show the oil patch is still the best place to find a job. 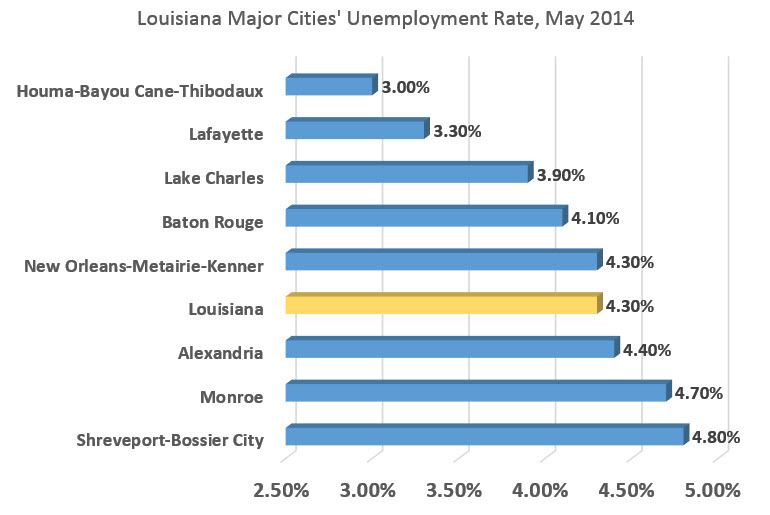 The lowest unemployment rate is found in Houma, Lake Charles and Lafayette. 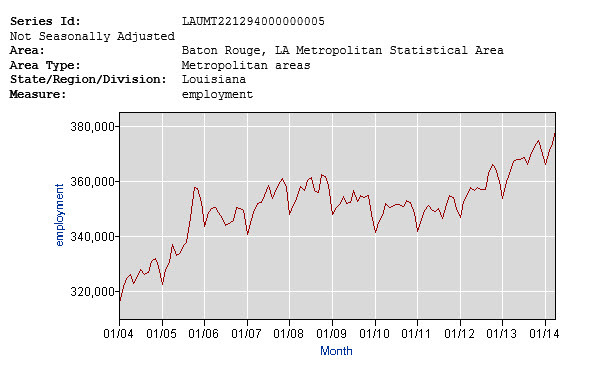 While the number of people employed varies since each major city in Louisiana varies greatly in population, the employment growth rate in each city tells a more realistic story because it can highlight where supply and demand imbalances might exist in resources which can expose opportunities. 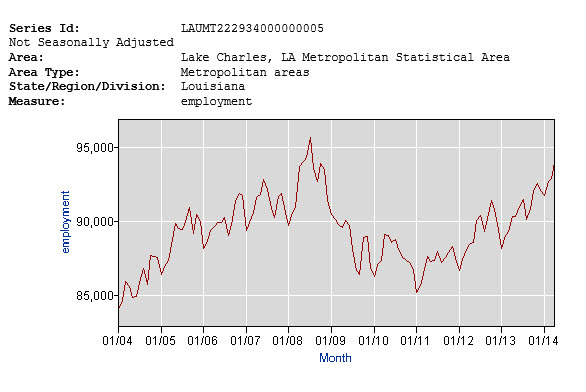 The charts below shows the trend in each city’s employment. The Regional and State Employment and Unemployment news release for May is scheduled to be released on Friday, June 20, 2014, at 10:00 a.m. (EDT). 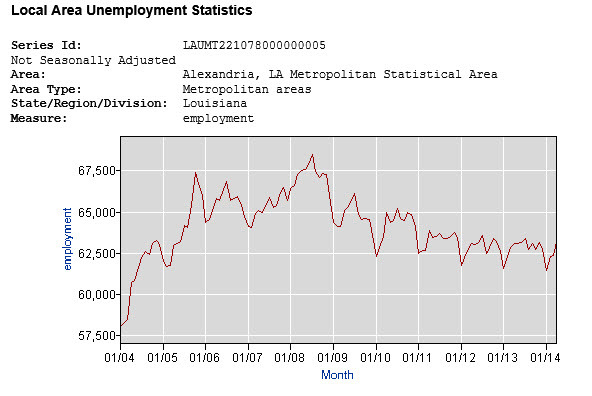 The Metropolitan Area Employment and Unemployment news release for May is scheduled to be released on Tuesday, July 1, 2014, at 10:00 a.m. (EDT).